A new patent has been filed by Apple to upgrade the MacBook keyboard which would prevent build up of contamination on the keyboard. Apple’s recent patent application suggests the company would like to improve its MacBook keyboard by including a mechanisms that would prevent or resist crumbs from contaminating the keyboard with dust, dirt, or food particles. 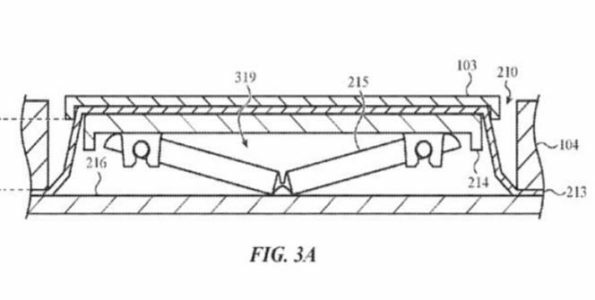 The patent is described as an ingress prevention for keyboards, it seems that a movable mechanism is coupled to a key cap as well as a guard structure which main purpose is to direct contamination away from the movement mechanism, thus preventing dust, food and dirt particles from building-up. The diagram suggests a number of methods are put in place to keep out particles, by using gaskets, brushes, wipers, flaps and seal gaps. It seems Apple suggest that one method used could be a membrane used beneath the keys would force out air each time a key is pressed, which would press or expel particles from in between the keys. It should be noted, Apple may or may not implement this patent to be used in future keyboards, but the concept is a really cool and useful tool to have handy on a keyboard.